- Kirk seeing everything in slow motion. - Scotty, hysterically: "Was it the coffee?! Are we going to go too, just like the captain?!" - Deela talking about Kirk like he's a pet. - Deela and Kirk debating the morality behind killing each other to survive. - Spock moving in slow motion. - Kirk faking out Deela. - Kirk coming from "out of the nowhere and into the here." 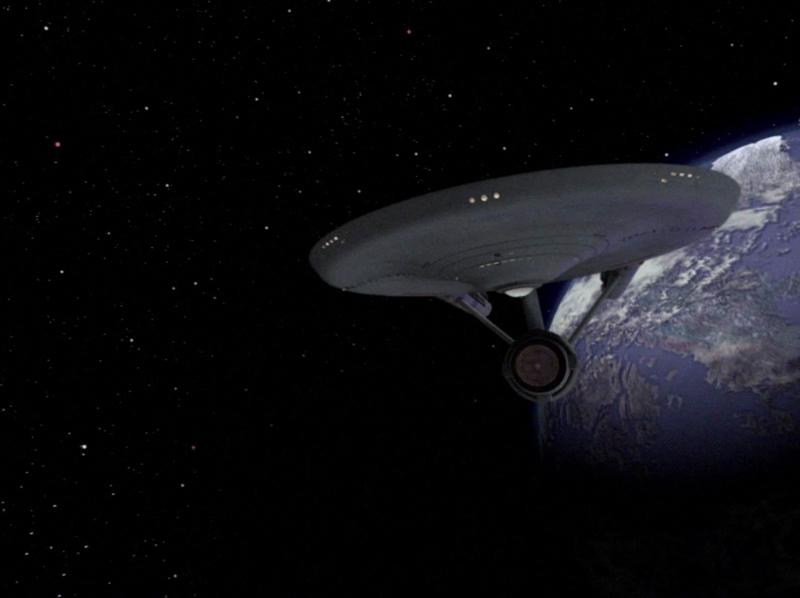 - Spock rampaging throughout the ship repairing everything at super speed. 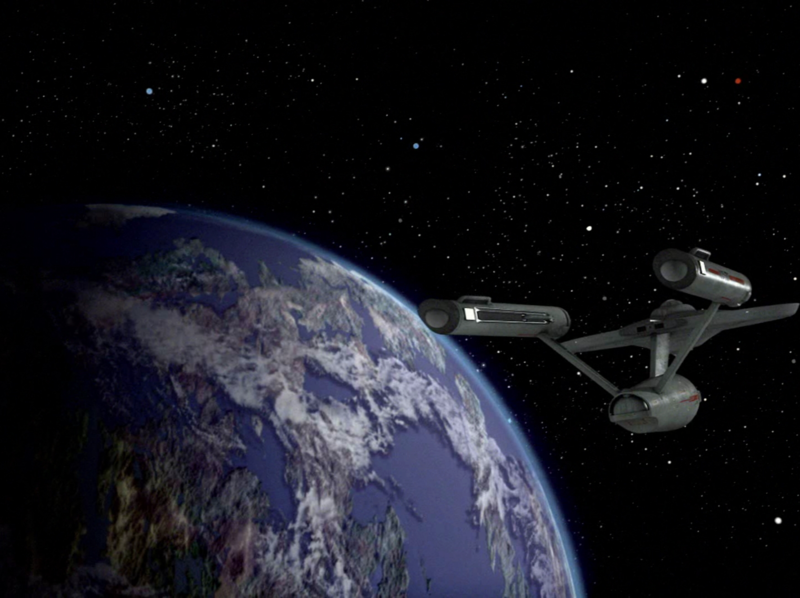 - Spock: "I found it an accelerating experience." A once thriving civilization of 900,000 is reduced to only five people due to a natural catastrophe related to volcanic eruptions and increased radioactivity. Somehow the anatomy of the aliens of the week (which sadly once again look exactly like humans) reacted in an odd way, producing a hyper acceleration effect. The hyper acceleration concept is highly intriguing and the episode explores its implications well, although I was disappointed with the decidedly comic book superhero (or supervillain?) way that these aliens acquired their superpowers. Volcano-induced radiation makes them move really fast! What's next, a radioactive spider bites Captain Kirk? Once you're substantiating your plot off of crap like that, it's not science fiction anymore. It's fantasy. Nevertheless, it's a lot of fun to watch the plot explore the implications of two different groups of people experiencing time at different rates of speed. A better written story with better production quality could make this concept shine even brighter I'm sure. But what we have isn't so bad on its own. The idea of creating a buzzing effect to connote the existence of the hyper accelerated aliens was clever, as was Kirk writing it off at first as alien insect life. 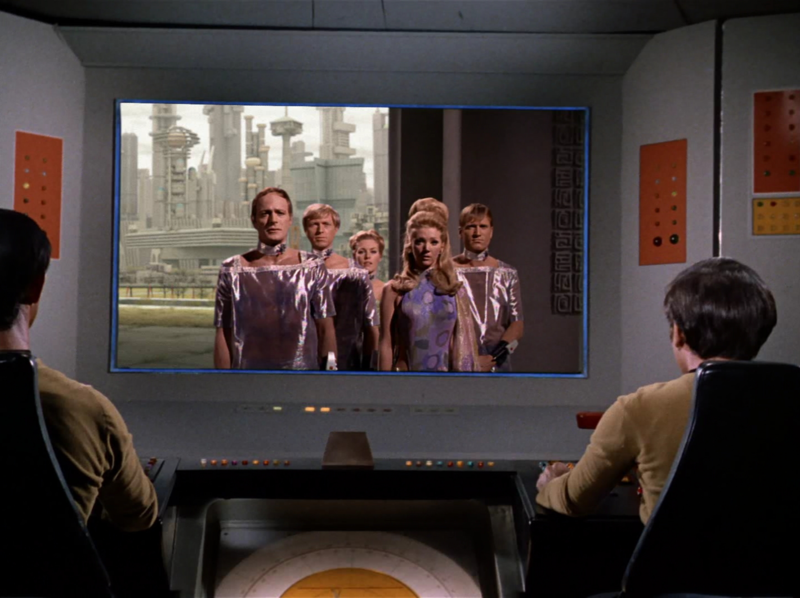 Seeing the crew frozen in time while Kirk walks around dumbfounded was eerie and Deela stepping out of the way of the phaser beam was one of my favorite science fiction moments of the whole series so far. Granted, we don't really know why the phaser wasn't accelerated too, but whatever. It was a cool scene. Likewise, you've got to wonder how much relative time passed between Kirk and Deela during the scenes when the Enterprise crew was busy figuring things out at their normal, slow pace. But I never got the impression that at any time the plot stretched the parallel realism of the two timeframes beyond the breaking point. 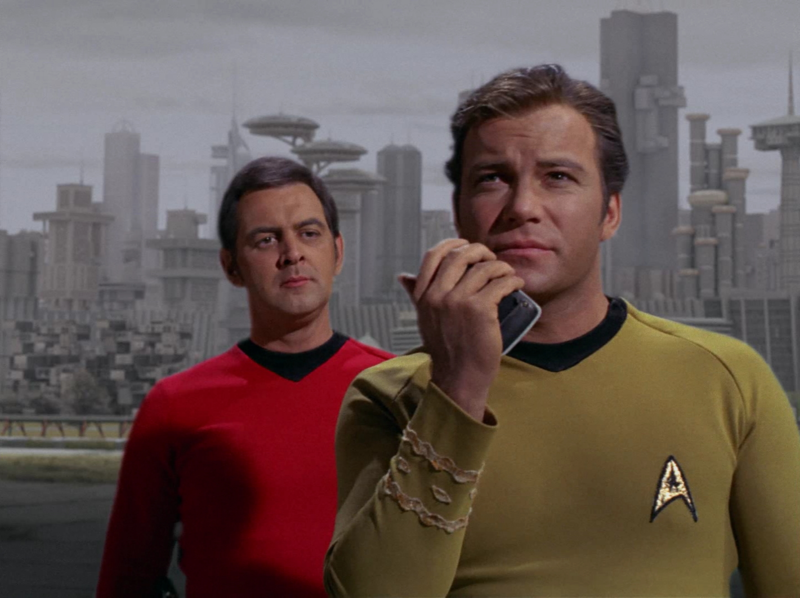 There were a few scenes when I was wondering if perhaps days or weeks had gone by on Kirk's side and it would have been nice to hear some lines indicating that, but it isn't strictly necessary. Unfortunately, much like the comic bookish premise, the aliens' motives were similarly poorly conceived. Summoning starships to their planet to take mates by force? Seriously? 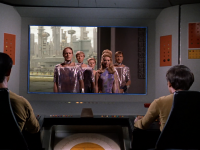 When Kirk suggested to Deela that they seek out the Federation's medical assistance and she wrote it off with a vague statement implying that they've tried things like that already, I didn't buy it. Why not send a few Federation exobiologists with expertise in fertility and genetic engineering to their planet, hyper-accelerate them, and get that research done in no time? For that matter, why not solicit a few volunteers for the original breeding plan? Compton was certainly all for it with minimal convincing. I'm sure there are at least a few other folks in the Federation ready and willing to help these poor souls breed too. Especially given the promise that they'll live in luxury. The climax of absurdity though was the rapid decline of Deela's character in general. After her first few scenes, her conceptual intrigue shifted into a plodding idiocy. It doesn't take long at all for Kirk to convince her that "he's made the adjustment," after which Kirk betrays her with ease. She respond to this with, "you are very clever, captain. You tricked me. I should have known that you would never adjust." No kidding. It was obvious to just about everyone except you, Deela. I'm not sure which moment was more painful: Deela's obliviousness, or Spock once again awkwardly asking the computer to analyze the situation, complete with a request for command advice. Who needs command officers when the computer clearly knows everything? I suppose the only scene even more ridiculous than all of that was the ending. Kirk and Deela essentially condemn Deela's people to death since neither side seems willing to explore alternative solutions and in a moment of rare insight Deela realized that their failure to execute on their forced breeding plan would ruin its effectiveness forever. And there you have it. Captain Kirk more or less ushers in a minor genocide. Though are aliens this stupid really worthy of survival to begin with? I can't get past the physics of this episode. With the speed at which these aliens are moving the force of their movements (force = mass*acceleration) would tear the ship apart, not to mention that the atmosphere would burn them if they were moving at such speed. That aside, I loved the shot of Kirk putting on his boots, a real acknoledgement of what he and the lady of the week did. I had problem with the alien faster than phaser ..
phaser wud have to be fired at speed of light ..
how come they were able to dodge it .. does that mean they are faster than light ..
That aside the lady of the episode was very cute ..
Deela's dress is something else! Asymmetric and revealing. The men's costumes look pretty ridiculous, but note the colors. What would happen if an accelerated person were to bump into a normal-speed person? I suppose they'd be knocked about really fast, as the buttons the fast people press must also move really fast. Doesn't make much sense. What would that feel like? Think of the G-forces involved! What prevented Kirk from grabbing Deela's weapon while he and she were "doing it"? And why was Rael so bad at defending himself when Kirk used her weapon on him? Why did Kirk et al. condemn the Scalosions to extinction when they found the antidote? Am I missing something here? 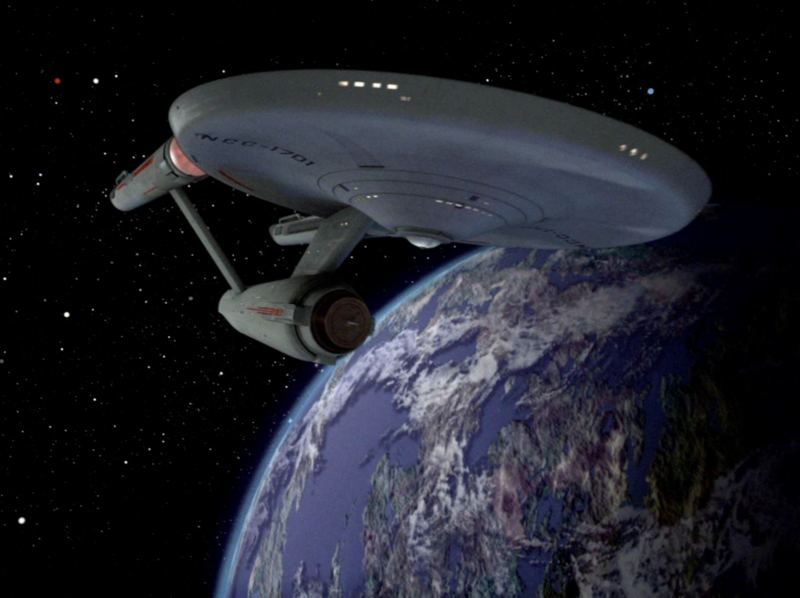 It sure would take a very long time from the Scalosions' point of view for the next space ship to wander by! What do they do with all that free time? In a similar vein, a tremendous amount of time must have gone by for the accelerated ones in order for the regular-speed people to get anything done. Aniket asks how the aliens move faster than the speed of the phaser ray, which he or she says moves at the speed of light. Think of it as the accelerated people moving at "warp speed". Problem solved. A more or less fun episode that, like many others, starts out good and just gets worse as it goes along. The technology presented in this episode could be used to (literally) take over the galaxy. They could transport to an enemy ship, drink the serum developed by McCoy, kill everyone in the ship, drink the serum to reverse the effects of the prior serum, and voila. This could be used to make almost instantaneous repairs to the ship in case of an emergency. 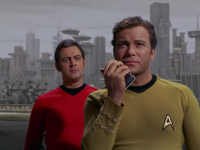 This technology could have changed Starfleet for the rest of their history. More on "Wink of an Eye"
Another remarkable scene: Deela's second interaction with Kirk being to grab him tightly and give him a sudden intense kiss, the first being simply, "Captain" only seconds before. I agree with Kethinov that the premise is silly -- hyper acceleration from volcanic eruptions polluting water and releasing radiation. Say what? Another problem with the "acceleration" is using the doors. The doors would open almost imperceptibly slowly. Would the doors even detect them so as to know to open? Well, perhaps there's a button they can press. But the doors are always fully open once Kirk has been accelerated, even on the bridge. Whatever. Must be one of those modifications the Scalosians made to the ship. But hyper-accelerating the door motors? The motors can't drink the Scalosian water. And then later the transporter? There must be lots of problems like this in this episode. Deela says "it always happens this way . . ." and "The way our parents and their parents before them." So after all that they now have a population of only 5? As pointed out on another website, the Scalosians' beaming aboard is problematic. Don't they have to stand still during the process, and hence be visible, even if smeared a bit, to Kirk and company? I think it would have been better if the Scalosians had their own transporter and beamed themselves aboard. That would also make plausible their getting the freezer device on the ship. Rael claims they are superior, so why not? Why does Kirk say, when saying goodbye to Deela, "I can think of nothing I'd rather do than stay with you. Except staying alive."? Sorry if I'm missing something obvious, but wouldn't he live just as long on his own time scale? Didn't Deela point that out only seconds before? For the crew left on the ship it would be different, but he wouldn't care if he decided to join Deela et al. Lots of problems, but the episode does have its fun moments. Yet more on "Wink of an Eye"
When Kirk fires his phaser at Deela, he aims it right at her face! Pretty rude, no? ""Granted, we don't really know why the phaser wasn't accelerated too, but whatever. It was a cool scene."" For someone who is hypercritical of TOS you missed the boat here. Kirk drank something to become accelerated. Why would that affect his phaser? Still more on "Wink of an Eye"
Since my last post here, I have realized that my idea of the Scalosions having their own transporter ruins another aspect of the story, which is that Kirk could not sabotage it. OTOH, a race that advanced really ought have one. Maybe Kirk couldn't get the weapon from Deela while they were "doing it" because she could still scratch him, causing the deadly "cell damage." (What a phrase: "cell damage"!) Whatever. A lot of time must have passed for the accelerated ones. I mean A LOT. This would give Kirk plenty of time to (pretend to) "adjust." The scene where the phasers are whisked out of Kirk and Spock's hands is extremely well done. It looks great even when you know it's coming. And the music goes really well with it, too! Bravo! The question and answer session with the computer was particularly bad here. "Have we been invaded?" Say what? A huge contraption has been attached to the environmental equipment, and they wonder if they've been invaded? May I say that I don't find the computer Q&A sessions to be a bad idea in general. AI could have come quite a ways in 300 years, so the computer may be able to do some careful reasoning with all its data using a vast library of knowledge (knowledge base!) to assist it. OTOH, the computer certainly wouldn't (or wouldn't have to, at least) sound so monotone. "Kirk drank something to become accelerated. Why would that affect his phaser?" Maybe drinking the potion made him emit some sort of time distortion field that would affect objects he came in contact with? There's plenty of ways to rationalize it. The episode should have done it explicitly, I agree, but the scene is fun enough that I'm willing to forgive them for not explaining it explicitly. Kethinov: Of course there are plenty of ways to rationalize what you were trying to say. Balance of probabilities, however, suggests that my explanation is more likely as well as being more simplistic. I am not of the opinion that an episode needs to add dialogue explaining every instance. If the phaser is slow, then it is slow. As long as some reasonable (and in this case it is more than reasonable) explanation supports the occurrence, then they need not explain it. In science fiction that would bog down too much time on explanation. My only real problem with this episode is EVERYTHING! Like others here, the physics is the biggest problem, but so are the timelines of the accelerated folks and the slow pokes. They simply don't mesh at all. - Shock waves all over the place. - Broken bones and shredded flesh once touching anything. - If slowing down enough to touch something, not becoming visible for an instant. - Assuming one was able to survive with bones and flesh intact, any object touched would be destroyed immediately. I did enjoy seeing that Kirk really got to slap leather with that chick. Talk about a quickie! !